Just got back from Stoneleigh (in the 993, of course). 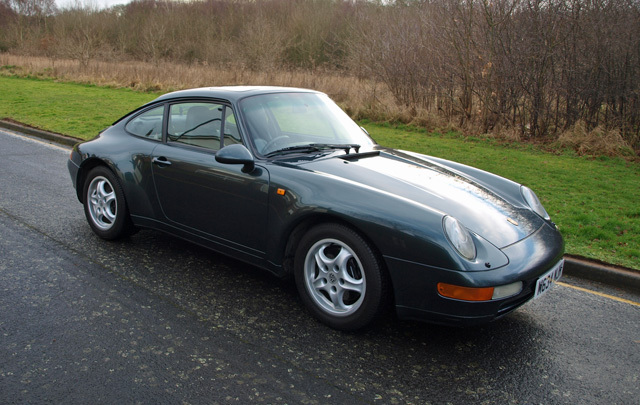 Two interesting 993s at Silverstone Auctions sale - will be offered this weekend so we should know prices on Monday. Amarinth Violet/Black cabrio is a bit Marmite but black interior could have been be worse. Car looked OKish. Manual. Aventura Green/Black needed total front end respray back to screen and some correction. Looked as if scuttle had been done. Black interior, softback seats, manual. Looked good starting point for someone. I like the colour - trade does not. Ex-PCGB car, under 80k miles. Are these wheels correct? Not sure if a/c. Had a chat with Nick Faure. Best (ordinary) 993? NB, pre-Vario 2wd 6-speed manual. Get in there! Wheels are iffy on both cars. Original Porsche 16's on the green one which were standard at the time but aesthetically too small for the arches. Don't ride any better than 17's and give a 'floatier' drive due to the larger tyre sidewall. Not keen on the 996 or Boxster wheels on the purple one. Always amazes me the way dealers never mention the wrong wheels on cars. Although not popular, the wheels on the Aventura are correct to type. These were the standard 993 coupe wheel, but many first buyers seemed to have ticked the 17" upgrade box. The wheels on the purple cab are plain wrong, none 993. Maybe just me but I'd take Aventura over that Purple anyday. So that's £23,920 with premium (and VAT on premium). I think. Rare colour, nice interior colour. Factor in goodish respray and inevitable other work (say £3-4k?) and you'd get a nice car for £28k or so. Missing hardbacks + 17" wheels. I expect as ex-PCGB it will have a/c. What happened to violet convertible? Didn't know 993 amaranth exist but there are certainly not many. That colour only works on a coupe imo. Having been to a few classic car auctions, there are some bad cars put through and you really have to be careful what you bid on. Their description of this car doesn't inspire confidence. Their catalogue did have some impressive cars though. Don't think the cab sold. Was up yesterday but does not have a price listed against it. Let's see - could be a good buy for someone. Thanks for the replies. The sixteens on standard ride height give a wonderful ride....I know I have tried them and I have piles, whereas Kim does not. Well Im certainly not going to ask how Mads knows that! If you can keep your head whilst all those around are losing theirs you obviously haven't grasped the seriousness of the situation! What does 'Ex PCGB' mean? Tell me it does not mean that it belonged to someone who joined an owners club or ran one. I thought the days of 'Club members car' and 'enthusiast owner' were gone. It's described as being a car once owned by Porsche Cars GB. You could well be right, but it's usually taken to mean either an ex-management car - in the days before they could dish out diesel Cayennes or big Audis to execs - or maybe Press. Which might mean it's been thrashed, but can often result in totally over-the-top maintenance. Certainly a higher spec to impress journos, hence me thinking it might have a/c. Porsche is not known for dishing cars out to all and sundry and any mad japes by journos would have been done 20 years ago. Whoever owned it recently, and clearly set the car wash to 'stun', is probably a worse custodian for it than any hard-driving hack two decades ago. "...was the property of Porsche GB". Any dealer buying these cars expects them to be tip-top and warranty-able in order to retail. Who knows. "...was the property of Porsche GB". Surely every UK car was once the property of Porsche GB until someone bought it from them? Pictures in a mess and not showing correct ones.